There are many, struggling financially, in Stark County, Ohio. More and more food pantries and soup kitchens are showing up. Some are eligible for county food assistance. However, these services do not cover the supplies needed for daily personal and oral care. Nor do they provide what is needed to keep a home healthy and clean. In 2015 this reality was brought to Father Aleksa Pavichevich at St George Serbian Orthodox Church, by congregant Linda Cameron, along with a concept for a project that may help fill that need. 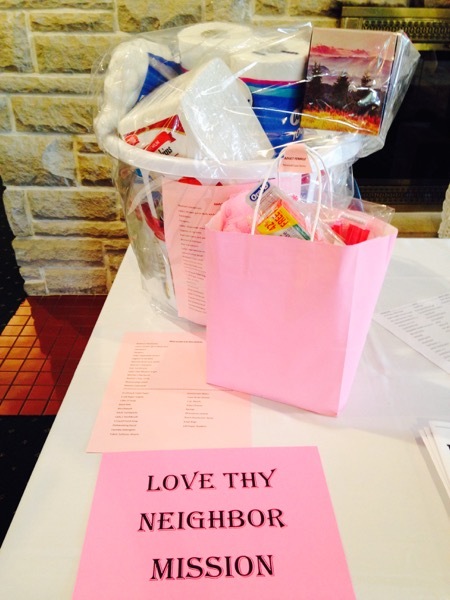 In May of 2015 the LOVE THY NEIGHBOR Mission of St. George Serbian Orthodox Church, Jackson Township was launched. 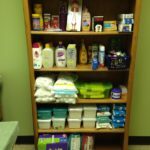 The objective of this non-profit ministry is to provide households in need with an assortment of personal care, oral care, baby care, laundry and cleaning items, packed into a sturdy laundry basket. 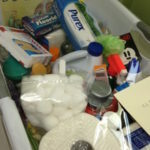 Any clergy person, LSW, RN case manager, school Family Support Specialist or Community Liaison, or councilor at any community service organization in the Stark County area, may submit a referral for any of their clients to receive a Love Basket, no questions asked. So a campaign to spread awareness of this non-food, non-clothing mission was launched and continues. The need for monetary donations and donations of items to keep the pantry stocked is ongoing. The congregants of St. George have been very generous. The first Love Basket was received in February 2016. To date, 23 households have been assisted. Seventy three individuals, from newborn to senior citizen. Two households, of women and children, were in temporary housing. Half of the individuals served were children and teens. But it has only been ten months. Referrals come in every week. The approximate retail value of a Love Box, customized for a family of four with an infant is $70.00. Nine of the households we’ve helped thus far were families of four or more. We are in constant need of donations from businesses and individuals to make this mission thrive. A very small group of church member volunteers carry out the tasks to serve many. The name of this mission is from scripture, ( Mark 12:31) and is always printed in all capital letters because “There is no other greater commandment than this” HE said. The mission statement of this ministry – it’s name, LOVE THY NEIGHBOR. Donate items from our Donations Needed list. Donate your empty aluminum cans to be recycled for cash to buy needed items. 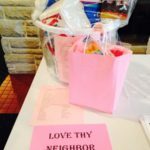 Write a check to LOVE THY NEIGHBOR Mission. Place cash in the collection jar in the church. Support the mission’s fund raisers. Volunteer your services to help carry out this ministry.